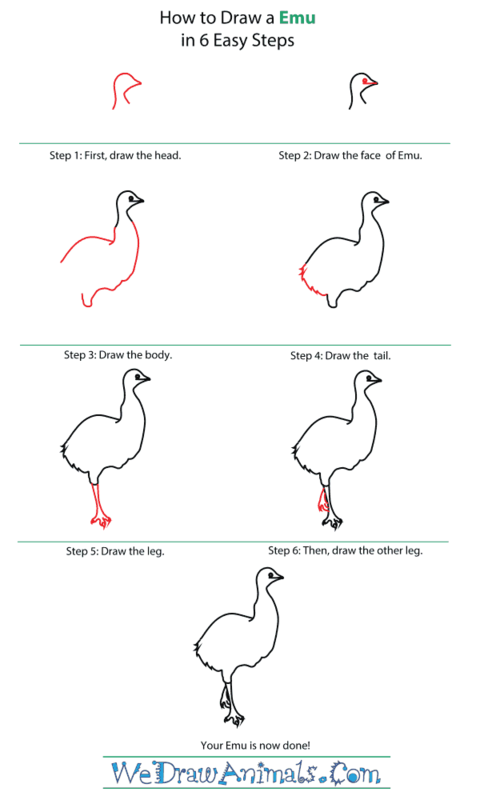 In this quick tutorial you'll learn how to draw an Emu in 6 easy steps - great for kids and novice artists. At the bottom you can read some interesting facts about the Emu. Step 1: Draw the head as shown above. 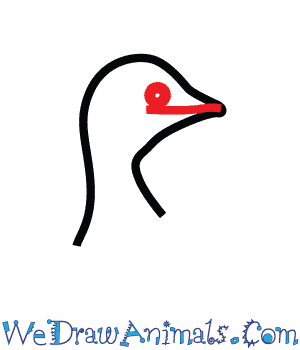 Make a point for the beak, and then continue drawing down some to define the neck a little. You will want to make the neck thin. 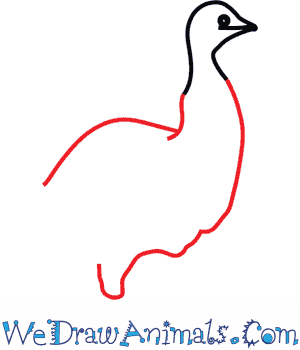 Step 2: Use a circle large dot for the eye, and a single straight horizontal line to crate the mouth of the Emu. Step 3: The body might be tricky, so you’ll want to carefully look at the picture above to draw it. You’ll want a large bump at the bottom to draw the leg off of, and you’ll want to make the neck longer as well before making the thicker body portion. 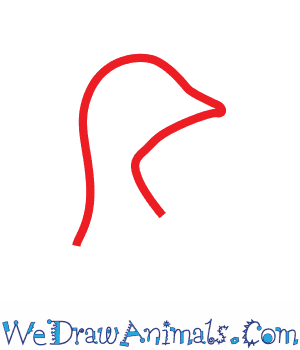 Step 4: Draw the tail by filling in the gap left by the body, except that you will want to add in a lot of shar bumps and edges to create the feathers. Step 5: Draw the leg using two lines going down from the body that split off so that there will be three toes. Draw small lines to show how sharp the toes can be. Step 6: The other leg will be mostly hidden by the first one, so you will only need to draw part of the foot to make it. 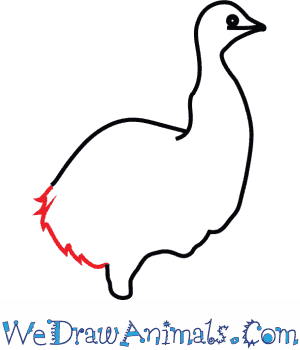 Your Emu is now done! Emus make their homes in the forests and woodlands of Australia, though they can be found in most any habitat. The emu is a huge bird. The largest emus can be up to 75 inches high! Even their eggs are huge, with an average size of six inches long! Emus weigh between 40 and 130 lbs. 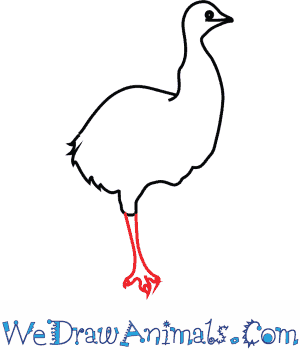 Female emus are usually slightly smaller than males. The emu’s eggs are dark green in color, which makes them look like they were just dyed for Easter Sunday! They’re also heavy, weighing between one and a half and two pounds! 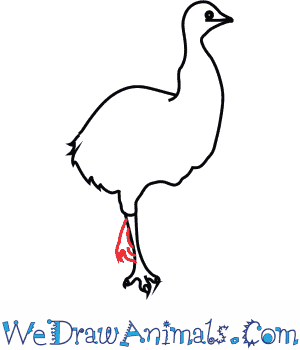 Emus have three toes on each foot. This helps them to run fast. An emu can run 30 miles per hour. 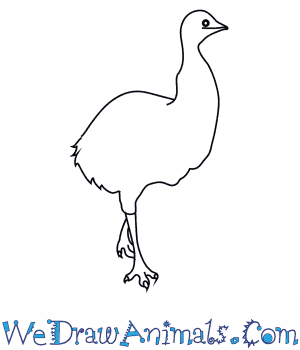 Believe it or not, emus actually have wings! They’re small, only about eight inches long, but they help the emu keep its balance while it runs. Emus defend themselves with their strong claws. They use their claws while kicking their enemies. The emu’s legs are the most powerful legs in the animal kingdom. They could even tear down a wire fence if they needed to. Also, emus tend to pant on hot days as a way to cool down their bodies, the same way dogs do.